This is a large and diverse orchid genus with an equally diverse number of growing habitats. Oncidiums may be found growing anywhere from sea level in the tropics to the high elevations of the Andes. This obviously makes cultural generalizations a little more difficult. 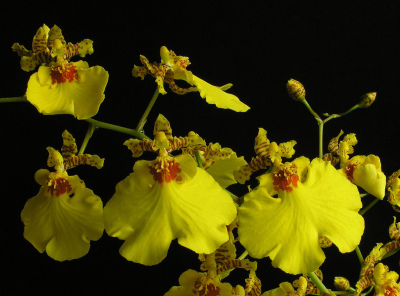 The Oncidium alliance is very popular among orchid growers due to its cultural flexibility and striking sprays of long lasting flowers. The plants may be grown with relative ease in the home or under a sheltered patio. Light- The majority of oncidiums thrive in the same light conditions as cattleyas, roughly 1,500 to 2,000 foot-candles. Some, such as the terete-leaved species and the mule-ear group, can tolerate even higher illumination with positive results, while the cool-growing species are best grown with somewhat less light in order to keep the plants cooler. Water- requirements vary with the type of plant. Plants with large fleshy roots or leaves need less-frequent watering than thin-leaved or thin-rooted plants. Watering should be thorough, and the medium should dry at least halfway through the pot before watering again. This may be every two to 10 days depending on weather, pot size, type of oncidum and, potting medium. Plants not actively growing should be watered less. Temperature- Oncidiums grow in many different habitats. They are found from hot, humid tropical lowlands to the cool and misty mountains. Some are found in places with almost desert-like climates for much of the year. 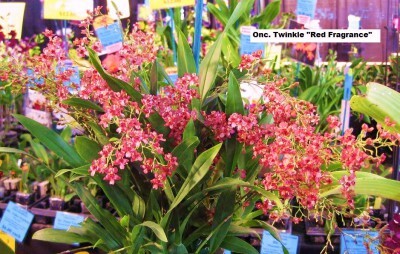 (Please remember we are a nusrery in hawaii and do not grow the cool/cold growing oncidiums) Most Oncidiums and their hybrids are intermediate in temperature preference. For the best results provide nighttime temperatures of 50 to 65°F and daytime temperatures under 85°F. the house. Also daily misting will help to keep your plant nice and lush. Air Movement- As for all orchids, air movement is key to growing nice healthy plants. The air should be moist to prevent desiccation, and the flow should be gentle. Good air circulation tends to result in rapid drying of potting media, something that is essential for healthy roots. Fertilize- regularly while plants are actively growing. Applications of 30-10-10 formulations twice a month are ideal for plants in a bark-based potting medium. A 20-20-20 formulation should be used on plants in other media or on slabs. Potting- Oncidiums should be grown in either medium Bark or sphagnum moss. They should be repotted once every two years. Ideally the plants should be repotted immediately after flowering or when the new growth has started to form.